After several days of preparation on Mahe, on 9 June Christine and I flew to Bird Island. 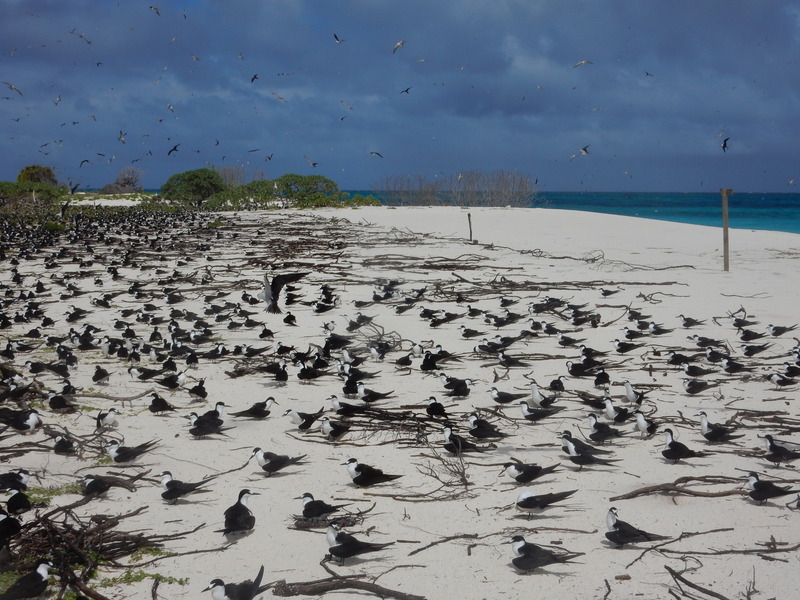 We had heard that Sooty Terns had begun laying on 25 May. This is unusually early for the start of their nesting season, which does not normally begin until June. We are here to continue our studies of the feeding areas used by Sooty Terns during incubation, involving tracking them using small GPS loggers. We deploy the loggers when birds have been incubating their egg for about a week in order to reduce the risk that our disturbance will upset them unduly. The time was thus ripe for us to begin our 2018 investigations. Since my arrival in Seychelles, we had enjoyed mainly clear skies and light southerly winds, but 9 June dawned with compete overcast and heavy showers, leading to bumpy intervals during the half-hour flight. Our first walks around the Sooty Tern colony were also accompanied by showers. Most alarming, however, was the extent of erosion of the north-western beach. We witnessed the beginning of this in July 2017 (see blog posted 27 July 2017), when many eggs and recently-hatched chicks were washed away or buried by sand, but it had clearly continued after we left the island last year. Not only has the sea encroached into the main part of the colony, but it has removed that part in which Sooty Terns nested most densely in recent years. This kind of erosion has happened before on Bird Island. In the early 1990s, about 50 metres of beach on the western coast was washed away. 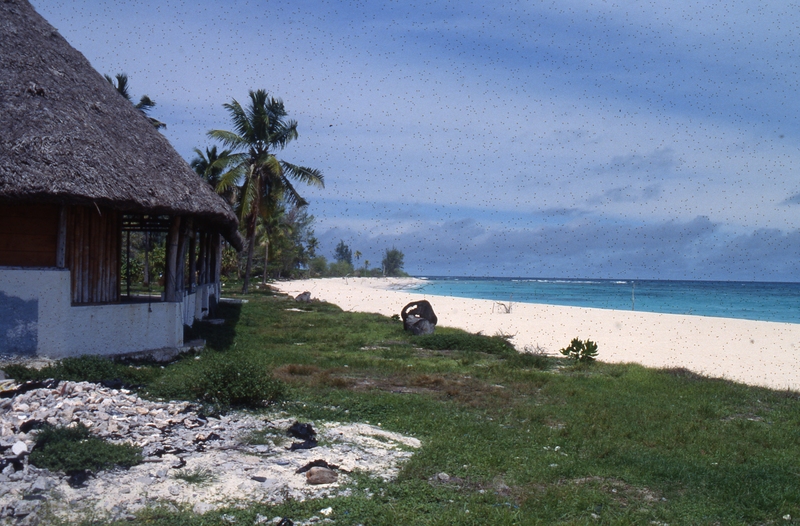 This was further south than the current event and washed away some of the chalets of the first hotel, built on the island in the early 1970s. The remaining chalets were considered to be dangerously at risk and were demolished, and a new hotel, the present one, was built on more stable sandstone ground further from the sea. The sea surface temperature in the western Indian Ocean has been rising in recent decades and low-lying coral islands like Bird are considered at risk from rising sea levels. It is premature to blame this recent erosion on Bird Island as a consequence of climate change. Moreover, the erosion appears to have involved a redistribution of sand rather than a loss from the island. The beach to the south of the severely eroded portion, and also a beach on the north-east, are now wider than previously. 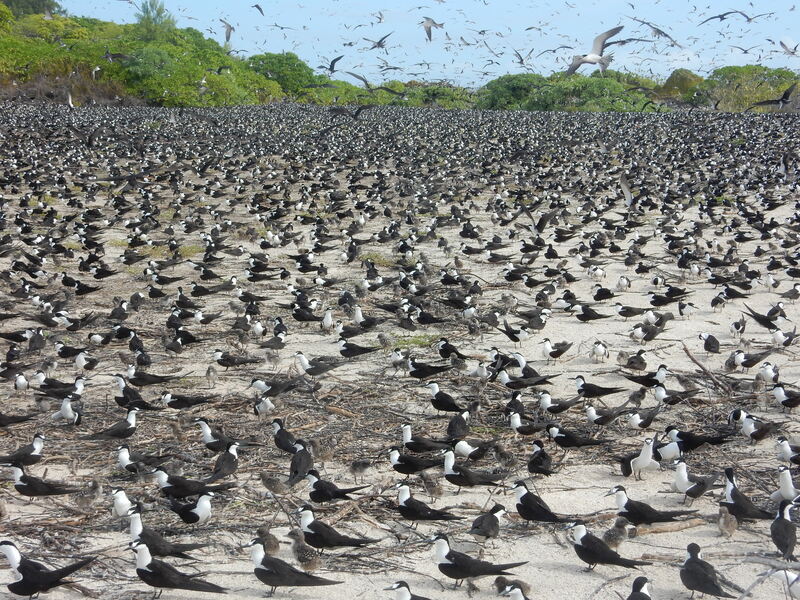 But efforts to secure the Sooty Terns nesting in more central locations of the colony would be advisable – after all, Sooty Terns in the breeding season are a major and spectacular attraction of Bird Island. Hi and thank you so much for the update.